Photos, videos and great stories, sometimes are not enough to illustrate the beauty and wonder of a particular scenic spot unless seen by own naked eye; one great "experience" is something money cannot buy. These are some of the mutual feelings that members of the Zamboanga Adventure Tourism Eco- Recreation Society (ZATERS) felt when the group embarked on it's first adventure tourism activity, - a 1.8 km trek on the "recreational" zone of the protected area of the "Pasonanca Natural Park" as the group encourages Zamboangueños to try trekking the "recreational area" to appreciate it's value and beauty and as a way of promoting tourism in the city. More than 30 members of the multi-sectoral adventure tourism group literally climb it's way to the densely forested area of the Pasonanca Natural Park extending to the then RCPI "repeater" area in Muruk (now being used by the ZC water District) with DENR 9 and SPELEO-Zamboanga (professional tour guides) leading the way up the park. Assistant Protected Area Superintendent Joel A. Baysa Jr. oriented the group on the various trees covering the park's "recreational zone" while ascending the 1.8 km zone. Some trees that caught the group's attention were: the century old- 25 meter-high Banuang tree commonly known as the "Binuang" tree, a material commonly use for fruit crates, toothpicks, pads and papers; the 70 year old- 20 meter-high Dao tree and the 50 year old-15-meter-high Kamagong tree. Mr. Baysa revealed of some sightings of wild tarsiers in the park. "But they (tarsiers) can only be seen during night-time since Tarsiers are nocturnal by nature" he was quoted as saying. The group, after reaching the peek of the Park's "recreational zone" proceeded to the "repeater" tower in Muruk where everybody was mesmerized and amazed by the picturesque view overseeing the entire city. From "up there" one can see the entire city comparable to "ants falling in line". A beauty beyond words and beyond compare. The Pasonanca Natural Park is located at the Western-most tip of the Zamboanga Mindanao Peninsula and North of the City proper. It is embraced by seven barangays in the Protected Area and Buffer Zones namely Bunguiao, Talosa, Salaan, Lumayang, Pasonanca, Dulian and Baluno. The Natural Park is a 20% to 90% slope category. Most often, the land configuration is rough, steep to very steep with the lowest elevation recorded at 78 meters above sea level while the highest is 1,364 meters above sea level. A noticeable mountain rock formation called mount Pulong-Bato is situated at the southern tip of the watershed. This rock formation has an elevation of approximately 324 meters above sea level. The watershed unit is traversed with streams and creeks draining into the main river. There are more than 20 perennial springs and six streams flowing within the area. 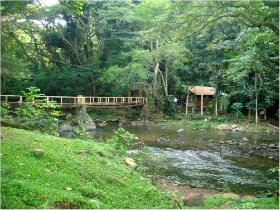 The main river is called Tumaga River. It is the source of domestic, industrial and irrigation water supply. It is the city's only source of potable ground water. Soil Strata of the natural park are composed of clay, clay loam, loam and sand. The dense forest of the park is a nesting/breeding ground for endemic bird species. Among those birds than can be found in the watershed are: Zamboanga Bulbul (hypsipetes rufigularis), Philippine Hawk Eagale, Philippine Falconet, Crested Serpent Eagle, Rufous Hornbill, Mindanao Tarictic Hornbill, Writhed hornbill, Mindanao Broadbill, Blue-naped parrot, Blue crowned Racquet tail parrot, Philippine Leafbird, and White-eared Tailorbird. Reports have it, that a Philippine Eagle was sighted in the area. Mammals are occasionally seen in thickly wooden portions of the forest. There are a number of wild boars, wild cats, deer, monkeys, tarsier and Mindanao Flying Lemur roaming the forest floor in search of food and prey. Reptiles such as king Cobra, coral snake Mindanao Pit viper, Boiga, Philippine cobra and Philippine Sailfin Lizard, Water Monitor Lizard (Bayawak) are likewise found in nooks and niches of the watershed in Zamboanga Mindanao.